Everything on this news page is about my life after moving away from Korea, but the articles are all related to Korea in some way. One of my favorite Korean foods is jeyukdeopbap. Prior to today, I had never made it myself. However, driven by outrageous prices on jeyukdeopbap (and decent Korean food in general around here), I decided to learn to cook it myself. It was complicated and required 16 ingredients, but in the end, I cooked some decent jeyuk. The photo essay is 1,279 words long and has ten photos. Click on the banner above to read the photo essay. Boring technical notes (feel free to skip these): I spent quite a while on the banner above, including the Taegeukgi Korean flag, which I rendered myself; it required the use of Inkscape, two new fonts (Korean Calligraphy and mh.ttf, which is the Hunminjeongeum font), and Pinta. I made the entire banner and photo essay on Linux (Fedorda 19), with the exception of the Hunminjeongeum font, because it would not install to Linux (it only worked under Windows, and even then, it had issues). I just finished adding ads to all the parts of this site that need it (i.e. all sub-pages accessible from the navigation menu and all the pages of the Korea blog, with the exception of the main page and a few pages like my résumé that are shared between the Korea site and other sites). I'm hoping this will generate significant revenue. If it does, I will add ads to my Japan site, my Taiwan site, and my programming site, as well. If it doesn't, then I won't. I've been thinking about it, and I think that if possible, I would like to resume work on both my Korea site and my Taiwan site. Just because I no longer live in Taiwan or Korea doesn't mean I don't sometimes have something to say about Taiwan or Korea. Just because I don't live in either country doesn't mean I don't sometimes go to a delicious Korean restaurant, or meet North Koreans at a matsuri in Japan, or date a Korean girl outside of Korea. Perhaps, rather than having three different blogs (one for Japan, one for Taiwan, and one for Korea), I should create a unified blog. However, that's just an idea, and I may decide not to do that. I really should try to keep pursuing my interests in Korean things and Chinese things. I shouldn't let my Korean and Chinese skills deteriorate too much, either. With my Korean, I think it is unlikely that I can hit new heights with my Korean from outside Korea, but I can at least hold it where it is. With Chinese, my Chinese level was elementary at best, so there is still a lot of room for improvement, even outside the (Republic of) China. Sure, I don't live in those places, but there is no reason I can't spend a certain slice of the year engaged in something related to Korea, and something related to Taiwan. I have some good news and some bad news. The bad news comes first: ad banners. I'm adding ad banners to this site (all of the Korea site-specific photo essays now have Google AdSense banners). The hosting fee for this site has shown up as a recurring charge on my credit card since 2006, and I have never really gotten any money out of it. I hope that with ad banners, this site will pay for itself, or who knows, even turn a profit. Now for the good news. I re-engineered this site to be based on IFrames instead of regular frames. Basically, the main area for text/graphics has increased from 50% of the browser window to 75% of the browser window. The navigation panel has decreased in size from 50% to 24%, which is good because it was far too big before. The end result of this overhaul is that there will be ad banners (good for me) and more viewable area, to the point where the extra space taken up by the ad banners will be offset (good for the readers). Therefore, the reader experience should improve overall with this overhaul, not worsen. Right now, only a minority of the pages on this site have ad banners. This will change. I intend to have ad banners on pretty much every page of this site, soon. Don't like it? Too bad. I pay for this site. I create this site. And for the literally thousands of hours I have spent on it, I have the right to get something out of it. Still don't like it? Okay, then send me a check at regular intervals that is more money than my ad banners generate. Then I'll take them down. No takers? It can run flawlessly even on a CGA machine. It could probably run on a decent IBM PC from 1981. How's that for compatibility?! 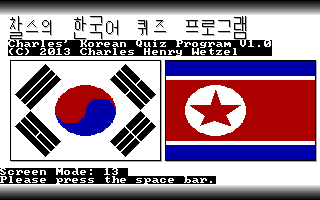 Click here to download Charles' Korean Quiz Program Version 1.0 (401 kilobytes zipped). 2. Unzip all the files (they should end up in a directory called CKQP). 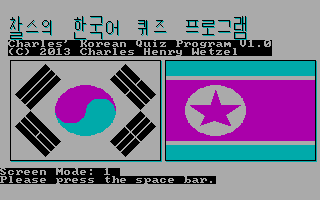 Basically, this is the same program that I used to quiz myself on Korean in 2006. 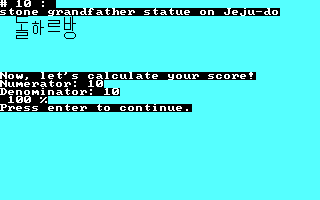 I wrote it myself, used it as my primary quiz program for my FCPS Adult Education Korean Level 2 class, Yonsei University KLI Level 1, and Yonsei University KLI Level 2. This year (2013), I cleaned up the code, added a title screen, different graphics modes, the ability to select word lists within the program, lots of extra error handling, and the ability to specify a "from" point and a "to" point to limit which words the user is quizzed on. However, the core of the program is pretty much the same as the 2006 version. Then I uploaded it to this site. I don't expect anyone to actually download this. Let's be honest, Anki (yes, even the clunky Anki 2) is better than this program. However, this program has a couple of special features. First of all, it will run on pretty much any IBM-compatible PC (even one without a hard disk, or one that just has DOS, or one that only has CGA graphics). It doesn't require any Hangeul card, Korean operating system, IME, or even a Korean font, since that stuff is all self-contained in the file. 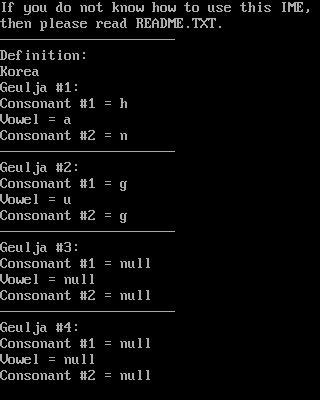 Second, I am proud of this because I wrote all the code to render hangeul and work with the Korean part of Unicode (encoding and decoding), from scratch. That is much more difficult than it sounds. I had to literally render each hangeul, and in many cases, I had to render several different sizes, then I needed to program the computer to know how to build a hangeul character (which means the computer has to know whether a vowel is vertical or horizontal, and resize the consonant accordingly, and know where to place all the letters on the non-linear characters). I accomplished my goal. It's a bit ugly, but it works, and in less than 40 kilobytes. After being parsed by QBASIC, it is 1,433 lines long. That's my largest program to date by lines of code! Normally I don't have updates on my Web site about my family or my life prior to 2006. But on rare occasions, I make exceptions to this rule, for an important family event or when the content is so closely-related to my present life in the Far East. Anyways, special thanks to my mom for scanning these photos and sending them to me on the other side of the world (she did this so I could show them to my student, Kana-chan, who had requested them; I decided to make a photo essay later). This video is about makgeolli (막걸리). To make this video, I literally climbed to the top of Mt. Fuji and had Japanese people taste test Korean makgeolli, and also went to various supermarkets and showed how makgeolli has already successfully spread to one other country: Japan. Makgeolli is a great beverage that I have enjoyed since I first tasted it in Seoul in 2006. I made this video for the Korean Ministry for Food, Agriculture, Forestry, and Fisheries Makgeolli UCC Contest. All video clips/images/sounds/etc. are either my own or public domain, unless they have entered the video by accident (as in I didn't put them there and didn't realize that they were in there). This video is © 2012, Charles Henry Wetzel. I'm entering it for the contest, but don't expect to win. That's okay. I've just made a tribute to what is definitely my favorite beverage. Yeah, that's right, I like it better than beer. I remember when I lived in the Shinchon (신촌) neighborhood of Seoul, and in the fall, a man would come with his cart, yelling "Makgeolli! Makgeolli!" and ring a bell and tip his hat. He'd sell us makgeolli right off of his cart. We'd take it up to the goshiwon (고시원) and have some great times! Hello blog. This is my first update to my Korean site in about a year and a half... I went to Jeju-do (my first time in Korea in nearly three years) for five days. Here is a link to a huge photo essay that I wrote. It's 5,132 words and contains 53 pictures, making it one of, if not the biggest of my photo essays so far. September 18, 2010: Luis Sanchez! I am going to jump out of your computer screen and attack you! Hahaha, actually no, I don't possess the ability (nor the desire) to do that. The reason I'm writing this blog post is because a Frenchman (in France) by the name of Anthony Doumenc contacted me and asked me to put up an article on my blog and get you to contact him or give him some contact info. I'm not sure if I'm supposed to put his contact info up here, but if you e-mail me, I can give it to you. That is all. Wow, I haven't updated this site in a long time! It has been over a year! In case you're wondering why I haven't updated, it's because I've been in Taiwan all this time and my Taiwan "adventure" has its own site. However, today's post is not about Taiwan, it is about something I have been considering since the first half of this month when my friend, [name deleted, J.D. ], sent me an e-mail with an interesting link. I'm thinking about moving back to Korea. Lack of any realistic permanent residency — it took either marriage to a Korean citizen or an investment of around US$400,000 to even stand a chance at EVENTUALLY getting an F-5. However, if you read on, this is no longer the case. Extremely cold reception from the local women of dating age — however, this changed radically in my last year in the country, during which I had a total of three (3) girlfriends, all of which were Korean! Risk of hate crimes and racist assaults. And the assaults I endured are still something that makes me angry quite often, but I realized one important thing — all could have been avoided if I hadn't been out after midnight (the assaults were of course not my fault, because I have a right to walk at night without being assaulted, but at least I know how to avoid them in the future). So those were the three big reasons why I didn't like living in Korea. Two of them were semi-solvable; #1 on the list was a cold, hard fact of the Korean Immigration Bureau, not changeable by me. However, [named deleted, J.D. ], an at-that-time public school teacher in Korea, sent me an e-mail with a link that eventually led me to some fascinating news: Korea has radically changed its immigration policy. Instead of the old system (either you have to have Korean blood, you're married to one, or you're rich to get PR), they have instituted a strict but fair points system. The bar on the points system is very high, but after consulting my friend Jeong-ok at the local Korean restaurant (who double-checked my assumptions on the official government form to make sure I hadn't made a mistake), we have ascertained that I could become an F-2-7 holder in Korea within a mere two years! The points are based on various things, most notably, age, educational level, Korean language proficiency, income, etc. There are 120 possible points; getting 80 means you can get an F-2-7 (long-term resident visa) good for three years. At present, I score a 49, but with a master's degree, I could probably qualify provided I made a few "quick fixes." After living in Korea for three years on an F-2-7 (and during that time basically unencumbered; F-2-7 visa holders have near-unlimited rights), the foreigner can get an F-5, and never have to visit the immigration office again. Now, I want to make it very clear, I am NOT saying that I will move back to Korea unconditionally. There is a thread on Dave's ESL Cafe and several people have announced that they are going to try to apply for this visa and see what happens. I refuse to live in Korea again until I have watched at least one or two other foreigners go through the process. I know the Korean Immigration Bureau — if there is any point of controversy, they will deny you a visa. However, if this F-2-7 turns out to be real, I may choose Korea over Japan. I don't really see how I could get a long-term, full-of-freedom, resident visa in Japan before about age 30; with Korea, I could get it much earlier, IF this points system is really what it claims to be. So basically, on my list of three reasons why I don't like Korea, #1 may be solved. #2 was solved a long time ago. #3 is unfortunately unsolvable, but if I stay in after midnight, I'll probably be able to avoid further attacks. Of course you're probably saying "well, okay, so you've removed those three bones of contention with Korea, but what is so great about it that you want to move there for a third round?" Well, I don't have time to write a paragraph about that, but let's just say it boils down to my fascination with Asian culture, my fascination with Asian languages, the food, low cost of living, the fulfilling feeling of "going native," the constant excitement of North Korea's antics, and many, many other things. I moved to Taiwan, to an island off the coast of the main island called Cijin, that is tropical, has palm trees and coconuts everywhere, multiple tourist beaches, etc. I am now renting an apartment that costs $106.45 a month and has its own bathroom. 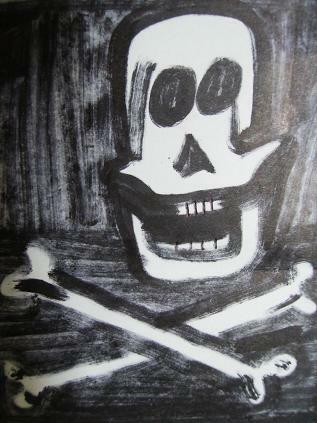 Copyright (C) 2009-2013 Charles Wetzel. All rights reserved.